This pleasant and leisurely cruise covers the Union and the Forth and Clyde canals between Edinburgh and Glasgow in Scotland. 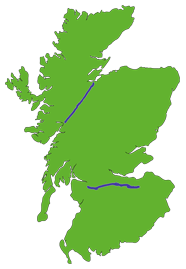 The route includes canal transfer between the canals using the 115 foot high Falkirk Wheel. Cruise out of Edinburgh over the Slateford Aqueduct, through the Wester Hailes Linear Park to Ratho (home of Edinburgh Canal Centre). The magnificent Almond Aqueduct takes you to Linlithgow. From the canal basin there are panoramic views over the town, its Palace, Loch and the hills behond. The Union Canal passes high above the town of Falkirk as you approach the Falkirk Interchange. The breathtaking Falkirk Wheel takes us down to join the Forth & Clyde Canal. Falkirk provides countless areas of interest to visit. Scotland's Roman heritage is never far away as the Forth & Clyde Canal carries the boats through splendid scenery to Kirkintilloch, then on to Cadder Village and into Glasgow. The Arm to Port Dundas affords us views over the city and features many historic buildings, including those of Charles Rennie Mackintosh. The Falkirk Wheel is 115 foot high - the equivalent of eight double-decker buses. It is 115 feet wide and 100 feet long. The wheel will lift loads of 600 tonnes (300 at each end) - the approximate weight of 100 adult African elephants. The structure stands in a 330 foot wide circular basin with moorings for over 20 boats. The first wheel-based boat lift was proposed by a German engineer at the beginning of the last century though it was never built. The Falkirk Wheel is the world's first rotating boat lift and the first boat lift to be built in Britain since the Anderton Boat Lift in Cheshire which dates from 1875. The total project cost was approximately £17 million and work took 22 months. The wheel is designed to last for at least the next 120 years. When cruising from Falkirk a rover ticket will be charged by Scottish Canals for use of the canals. The cost is £15 for up to three nights and £25 for any holiday over three nights. This ticket will be administered by Scottish Canals through their website and office. This payment will be taken on the first day of your holiday on arrival at the office at the Falkirk base. Usually covered in a week. Short breaks available from Falkirk to Edinburgh or Glasgow. Click on a boat base below for more information and possible routes from that base.